Growing up on an island, it's hard to imagine not loving west coasts. Sure, the east has its good points as the sun rises over the horizon, but it's those long, lingering sunsets that really make island life worth living. West, as I might well say, is definitely best. A long west coast, like the US's Pacific coast, is a special thing, where sunsets change with the weather - and where you are on that coast. Seattle's spectacular Olympic sunsets are one extreme, as are San Diego's southern orange fade to black. 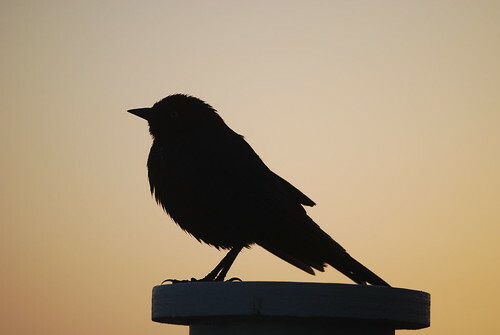 We were on Coronado Island when this little bird hoped up onto a pole, just in time to catch the evening light. It may have just been a sparrow, but in that evening light it became more than a little brown bird.